During last month's National Ryan White Conference on HIV Care and Treatment, I had the privilege of co-facilitating a listening session to gather input on the next editions of both the National HIV/AIDS Strategy and National Viral Hepatitis Action Plan. Joining me as co-facilitators were Dr. Laura Cheever, HRSA's Associate Administrator for the HIV/AIDS Bureau, and Dr. Eugene McCray, Director of CDC's Division of HIV/AIDS Prevention. Adapt healthcare delivery systems to meet people where they are at, especially by improving access to mental health and substance use treatment by co-locating services whenever possible. Foster integration of HIV and viral hepatitis prevention and care services into primary care settings. Combat HIV-related stigma and discrimination, including within the healthcare system. Enhance the response to HIV workforce shortages through programs such as loan forgiveness, clinical training for non-infectious disease specialists, and adequate reimbursement for services through Centers for Medicare and Medicaid Services. Improve provider education, comfort, and capacity beyond HIV clinics to discuss and prescribe PrEP and take sexual health histories. Continue to foster home-grown interventions for disproportionately impacted communities through the Secretary's Minority AIDS Initiative Fund. Improve the quality of HIV and STD education for youth. Develop and disseminate guidelines and care models for patients with HIV who are aging that address the increasing number of comorbidities they face, as well as additional strategies focused on HIV prevention for older adults. Support the increased use of consumers as peer navigators in education, outreach, and engagement activities, especially for "hard to reach" populations. Use Ryan White HIV/AIDS Program funds innovatively to address increasing incidence of HIV among people who inject drugs or misuse substances, including crystal meth and opioids. Support state-based modeling and other studies to capture accurate prevalence of the hepatitis C virus. Facilitate more sharing of resources, tools, lessons, and best practices from jurisdictions that have experienced "tremendous success" in their responses to HIV such as New York City, San Francisco, and Washington, DC, with other jurisdictions so that they can adopt and adapt those to local needs and circumstances. I'm grateful for these and all of the other thoughtful suggestions shared by stakeholders. We value their ideas as well as those we continue to receive as we confer with additional stakeholders and our federal partners over the coming months. These ideas are critically important as we develop the next iterations of the national HIV and viral hepatitis strategies. This was one of a series of listening sessions that are being organized to get ideas and feedback from a range of stakeholders about these national strategies, both of which are set to expire in 2020. 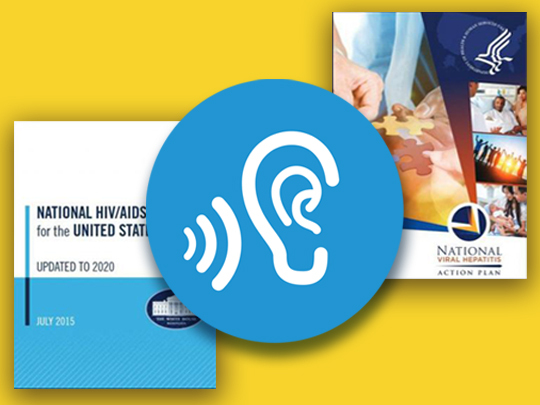 Later this month, we'll be hosting a virtual listening session and next month we'll host an in-person listening session at HHS Headquarters in Washington, DC. Read more about both opportunities.